Named after our sweet Piper Grace, and made possible by her very own prayer warriors, Grace Blankets has provided NICU linens to Children's Mercy Kansas City since 2014. In 2016, we branched out! Our mission is to extend our blanket giving to multiple hospital locations in various cities. Fort Worth, Arlington, Lubbock, Amarillo, Houston, Little Rock, Florida…and many more new donation opportunities to come for our sweet cause! 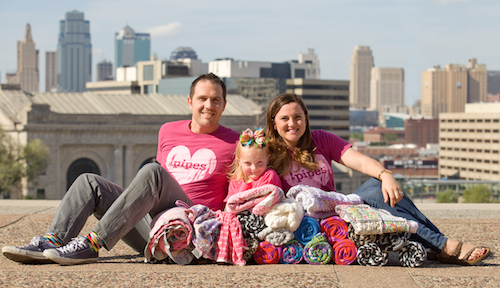 Grace Blankets was created in honor and memory of our daughter, Piper Grace, who lived her entire life in the NICU (10 months) at Children's Mercy Hospital in Kansas City. From the beginning of our NICU journey, we yearned to give back, and acknowledge our love for the NICU staff at Children's Mercy in Kansas City, where Piper lived. ​Matt and I have been beyond blessed to have such amazing gifts sent to us; as well as having our own money to spend on all of Piper's adorable blankets and linens. Most of the time, in the NICU, this is not the case. Our night time nurses pride themselves on the task completed at the beginning of their shift - bathing cute babies and giving them a fresh clean bed to sleep in. Our nurses are in LOVE with all of Piper's wonderful blankies, and it hit me...that's how we will give back! In any NICU, each baby gets a nightly crib linen change. I've been up at the hospital when nurses are scrambling to find nice blankets for these babes when the patient count is at an all time high. More often than not, stark white hospital linens are used; which are great, but imagine the warmth a new special blanket would give the staff, the parents, the babies in need! A blanket with color, a blanket with pizzazz, a blanket sent with love. Blankets donated can be used as gifts for families in need, isolette covers, bed linens for under baby (never covering) & often used in NICU linen supply rotation! We’ve also had very special blankets saved by hospitals to use by their bereavement committees, to comfort a family in a most senstive time of need. Want to donate blankets, moolah, or join our mailing list? Contact us through the form below.